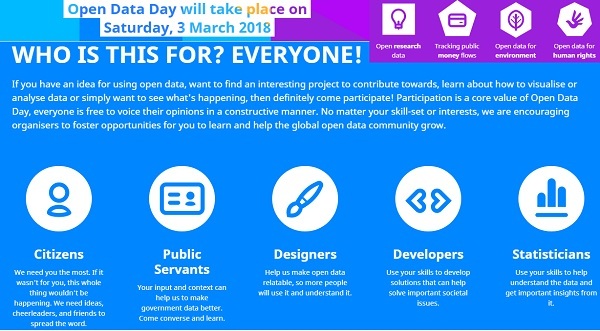 Open Data Day (ODD; #OpenDataDay) is an annual celebration of open data all over the world. Groups from around the world keep creating local events on the day where they use Open Data in their communities. As always, during ODD we expect to gain momentum and highlight the different uses that Open Data can have in different contexts. The ODD 2018 was an opportunity to show the benefits of Open Data and encourage the adoption of Open Data policies in government, business and civil society. Check out also the Lookback on Open Data Day 2017. All outputs are/will be open for everyone to use and re-use. "First of all, we were happy to see that this year a total of 406 events were registered on our world map! This is almost 100 more events registered in the opendataday.org map than last year. We have noticed growth mostly in the global south, specifically in African and Latin American countries. Stay tuned by future news on the Open Data Day website.